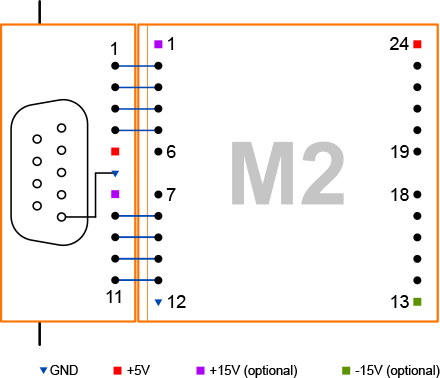 C2 and M2 devices are interconnected by eight interface lines. C2 Tibbits have dedicated ground, +5V, and +15V pins. Here is the illustration of how the ground line gets used. Tibbit #19 incorporates the DB9 connector, which requires the ground line. Since C2 devices have ground pins, there is no need to waste one of the available eight interface lines, so all lines can be put to good use and this comes handy for Tibbit #02 (RS232/422/485 port) that utilizes all eight lines.